Possessing a camera “with intent” (to commit espionage). Rockhampton Magistrates Court, Tuesday June 12, 9.30 am. Margaret’s trial is an escalation of harassment by the ADF, a malicious act against all activists around the Talisman Sabre war-games. 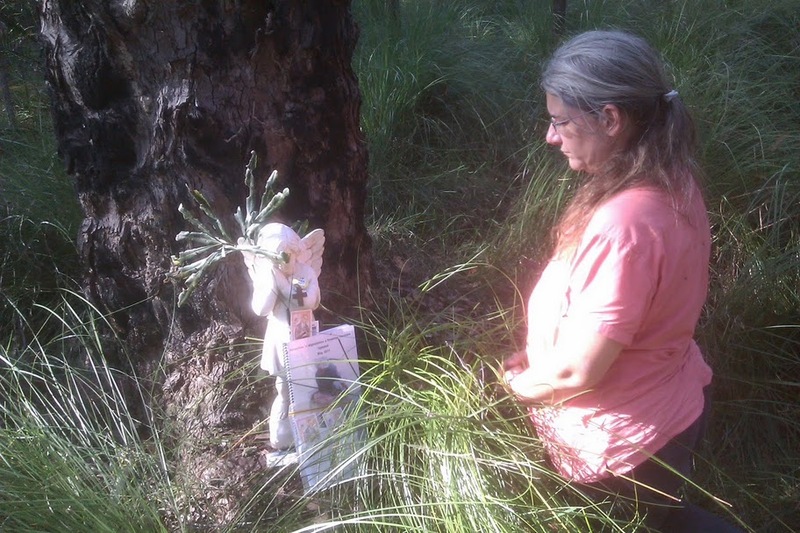 Margaret prays for peace at the shrine to blessed Franz Jaegerstaetter in Shoalwater Bay Military Training Area - 19 July 2011. This pic was taken and transmitted on her phone, and is not the occasion of a criminal charge (yet). Margaret has been charged under the Defence Act with possessing a camera in the Shoalwater Bay Military Training Area (SBMTA) – with intent. The Crown must prove that Margaret intended to photograph the military installations and weapons found in Shoalwater Bay. Margaret tells a different story. 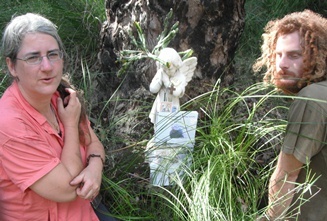 After her experience at trespassing with the Bonhoeffer 4 in 2009 (Jessica Morrison, Simon Moyle, Jarrod McKenna) Margaret committed herself to a “Shoalwater Wilderness Pilgrimage” in 2011. The Bonhoeffer Four, July 2009, trespassing into Shoalwater Bay. Margaret’s husband, Bryan Law is likewise a nonviolence activist, and was involved in the planning for the wilderness pilgrimage and shrine. Bryan had intended to help build the shrine, but was prevented by poor health. He gave his camera to Margaret and asked her to take photos of the shrine, which he would invoke in a subsequent ploughshares action. Margaret and Andy at the shrine. This pic was taken on the camera and IS the occasion of a criminal charge. Thus Margaret possessed a camera in Shoalwater Bay with the intent of photographing a shrine to Franz Jaegerstaetter. The ADF has had her put up on a criminal charge. Since at 2007 peace activists have carried cameras into the SBMTA as part of trespassing actions. In 2007 and 2009 there were 23 trespasses, and while some equipment was held by police for a short time, it was eventually returned and no charges were ever laid for possessing a camera or taking a photograph. 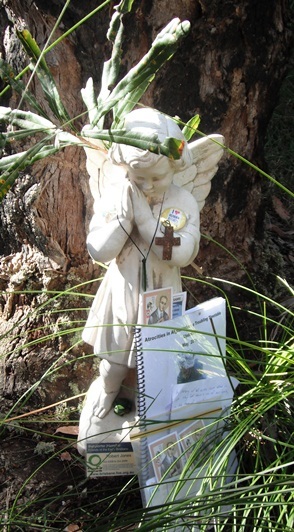 An angel, a cross, a piece of Ponamu from the Waihopai ploughshares trial, a badge, a totem from a Darrumbal elder, some Franz Jaegerstaetter prayer cards, a digest of civilian deaths caused by NATO in Afghanistan, all mixed into a shrine for the Shoalwater Wilderness Pilgrimage. It's not clear whether this is a criminal or non-criminal photograph. 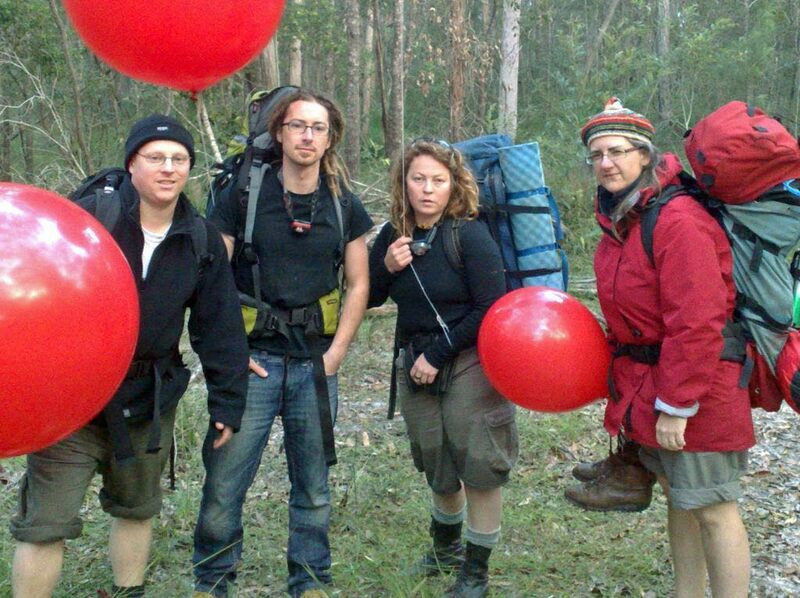 In 2011, Margaret and her friends Andy and Roberto were the only team to trespass. They called themselves the Three Jaegerstaetter Amigos, and liaised as usual with the negotiating team from Rockhampton Police. No mention was made by police of cameras and photographs being prohibited. For the first three weeks in July, everything seemed to be progressing as usual. The amigos entered SBMTA on 18 July, set up the shrine, and headed towards Samuel Hill air-base, encountering and blockading armoured equipment as they travelled on the East-West road. They were arrested on 20 July, brought to Rockhampton watch-house and charged with trespass. They remained in custody over-night and faced a magistrate in the morning of 21 July’ pleading guilty to trespass, and copping fines. The arrest and court process so far is exactly what happened to the Bonhoeffer 4 in 2009. The Police even handed back all the activists’ property….. until a “new” officer burst onto the scene at Rockhampton Police Station and reclaimed the camera “for investigation”. As it turns out, the ADF had made a complaint to Rockhampton Police that morning based on counter-espionage provisions of the Defence Act. What happened to change standard police procedure and bring on the new charge after a plea of guilty to trespass had been dealt with? Whatever it is, apparently it happened while the three Amigos were in court. Let’s try to remember…. Did anything happen while the three Amigos were in court? Well, yes, as it happens. Bryan Law, aided by Graeme Dunstan had carried out a ploughshares action at Rockhampton airport at 9.40 am that morning, during which Bryan used a garden mattock to put a hole in a $36 million “tiger” helicopter, rendering that particular death machine unable to fly. This “Rocky Tiger Ploughshares” had been very embarrassing for the ADF and its security – which was shown to be little more than a bag of stale old fart. In April 2011, Air Chief Marshall Angus Houston had been asked about the proposed ploughshares action. In his answer, he told the Senate Estimates Committee of the Australian Parliament that all helicopters would be kept safe and secure in Rockhampton. The “Force Protection Coordination Centre” had 10 full-time officers dedicated to provide that security. They failed completely. It seems that having failed to prevent the Rocky Tiger Ploughshares from happening, the “Force Protection Coordination Centre” retailiated against all the activists they could with escalated harassment by dredging up phony criminal charges. 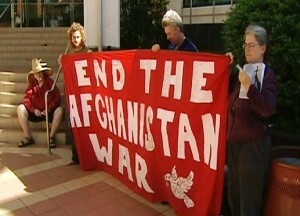 Three Jaegerstaetter Amigos hold a peace banner outside Rockhampton Magistrates court after pleading guilty to trespass. 21 July 2011. So Andy Paine has been charged with taking photographs, and Margaret Pestorius has been charged with possessing a camera – with intent. It is an abuse of process. Six months after TS11, three armed detectives came to Margaret’s home to interview her for an offence with a maximum fine of $100. They decided to charge her. Police prosecutors have since insisted the trial be conducted in Rockhampton, and they intend to call 7 witnesses from around Australia. Just attending the trial will cost Margaret significant resource. The prosecution has recently said they intend to claim travel and appearance costs for all the witnesses if they succeed in getting a conviction. It is the very model of a malicious prosecution. Of course the goal of harassment like this is to make direct action more difficult and more costly. The easy thing would be for Margaret to plead guilty and pay a fine. Margaret has decided as usual to stand up for truth and nonviolence. Her prosecution is a malicious and unfounded action by an embarrassed security state. Margaret will persist in acting for peace. In her action and trial, Margaret and her amigos have made some important moves towards sustainable and effective resistance… at a time when such methods are needed by the Australian peace movement. I reckon we should all help Margaret during her time of trial. Spread the word. Send messages of support. Attend the trial. Hold a solidarity event at an ADF base near you. 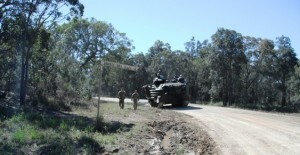 The three amigos deployed their banner and defeated this armoured personel carrier on 20 July 2011. Spies are really interested in stuff like this. Margaret will be pleading not guilty, and will put the Crown to proof. They must prove beyond a reasonable doubt that Margaret possessed the camera with the intent that it be used for taking pictures of battlements and war equipment. They haven’t put forward any evidence of that so far. Bryan Law will give evidence about what his camera was to be used for – photographing a shrine. The trial will put into the official record the Shoalwater story of blessed Franz Jaegerstaetter – and the atrocities being planned and practiced during Exercise Talisman Sabre. It’ll be a good lesson in jurisprudence for anyone who witnesses it. Now is the time to make our message clear – we will not cease until war is over.